Every day at Gibside near Gateshead, until Sunday 2 September families can embark on the free nature explorer trail during opening hours (including through to 9pm on Friday and Saturday evenings). The trail ventures into the woods where kids will need to look for clues that can be solved by finding the brass rubbing point. Once found, they’ll need to reveal the answer themselves. At Washington Old Hall in Tyne and Wear, families are being encouraged to become wildlife detectives and try different ’50 things to do before you’re 11 ¾’ activities each week in the Nuttery. Every day from 11am to 3pm, there’ll be a nature-themed activity such as creating wild art, making a home for a wild animal – including a spot of den building – making a home for bugs, planting a pea and lots more. There is also the opportunity to watch the birds in the bird hide and relax on the top lawn while playing garden games. The café is open all day serving freshly made sandwiches, homemade soup, scones and cake. There will also be a different themed activity on during each week, from Monday to Friday 11am to 3pm, including storytelling sessions with Chris Bostock, creating giant nature pictures, bird ringing and a blindfold rope trail. Afterwards, head to Strawberry Castle Play Area, build a den in the woods and try the low ropes course. At the café, there is a special ’50 things to do before you’re 11 ¾‘ lunchbox, which includes five items for £4.50 and lots of ideas for outdoor activities. Perfect for kids. Follow a rope around a course in the woods whilst wearing a blindfold. 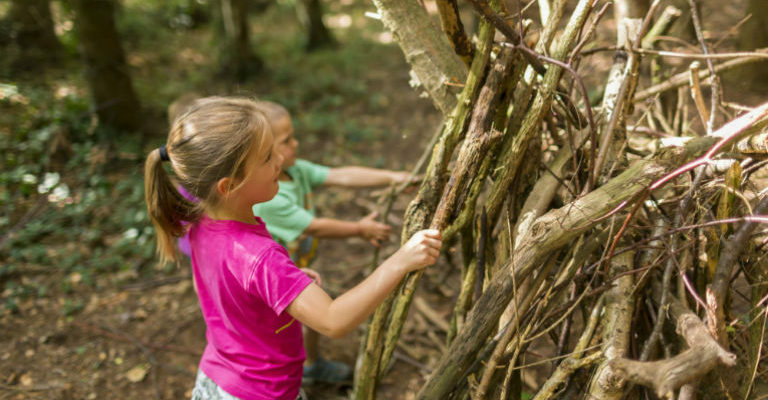 Use natural materials to build a den in the woods. Contribute to the giant nature pictures. Get up close and personal with small birds, hear about their migration patterns and how we track them. Can you engineer a tiny house the right size for a mouse?